Most people know of Greece’s ancient and Byzantine past, but few know its Medieval past. Anna Achiola is a visionary who created and has run Rhode’s Medieval Rose Festival every June since 2005. Standing on one of Rhodes’ eastern beaches you can see Turkey’s flank. It is a vision which reminds you why this island has been a crossroad of cultures from ancient to modern times. Rhodes, the largest island of the Dodecanese, is the meeting point of three continents. Regardless of the island’s ancient moorings, the most characteristic part of Rhodes is its medieval old port, with its Palace of the Grand Master, the Street of the Knights, and the Old Town that is considered one of the best-preserved Medieval Towns in Europe. The annual Medieval Rose Festival celebrates Rhodes medieval past. Participants don medieval costumes of brave knights, charming ladies, wizards and jesters as wandering mistrals parade around the Old Town. The Medieval Rose Festival was the brain child of Anna Achiola the festival’s Creative Director and is held June. “I think the idea existed in my mind from a very young age.” Achiola says to Neos Kosmos English Edition (NKEE). As usual many major passions begin as hobbies but Achiola soon realised the scope of the idea and contacted friends who could contribute. From 1309 to 1522 AD Rhodes and the other Dodecanese islands were administered by the Order of the Knights of Saint John of Jerusalem, known today as the Knights of Rhodes. This was a multinational order consisting of seven nations and thus speaking seven languages. The Knights are few in number, only 500, and mostly Franks who resided on the island. But, within the walls of Rhodes there lived and worked more than 4,000 Europeans along with local residents and Jewish and Armenian minorities. This multicultural society lasted for 213 years and many languages were spoken, including Greek and all the languages of the Order of the Knights and Latin, which was the official language of the Order. “In this multicultural society, you can add the trade between Knights, Turks and the Egyptian merchants who would arrive on the island,” adds Achiola. Rhodes was the last European territory that resisted the Ottoman Empire, since Constantinople, the capital of the Byzantine Empire, had fallen in the hands of the Ottomans in 1453 AD. The Crusaders had also lost their territories in the Middle East. Rhodes had suffered a siege by the Ottomans in 1408 AD. “Our Byzantine-Medieval cultural and architectural heritage constitutes a unique setting to host such festivals that aims not only to entertain the attendants but also to report on the unique history of our island,” underscores Achiola. Over 150 volunteers take part in the event every year, and last year more than 50 artists and re-enactors from Greece and Europe took part and the countries that participated included Italy, France, Germany and Portugal. This international effort was supported by the Greek Ministry of Culture and included street theatre, live music, medieval dances, bazaars with authentic products, workshops (for stilts and fabric dolls), jugglers, an exhibition of medieval manuscripts, old medieval toys, chess and archery competitions, horse rides and several shows in four squares of the Old Town. As in all endeavours of this nature funding is always an issue, as Achiola points out to NKEE: “The Festival is an expensive event that needs more support from the local authorities. The local and international dimensions of this project are not lost on Achiola: “We want every year to add the castle of another municipality in the Festival in order to promote our Byzantine architecture heritage in its whole. 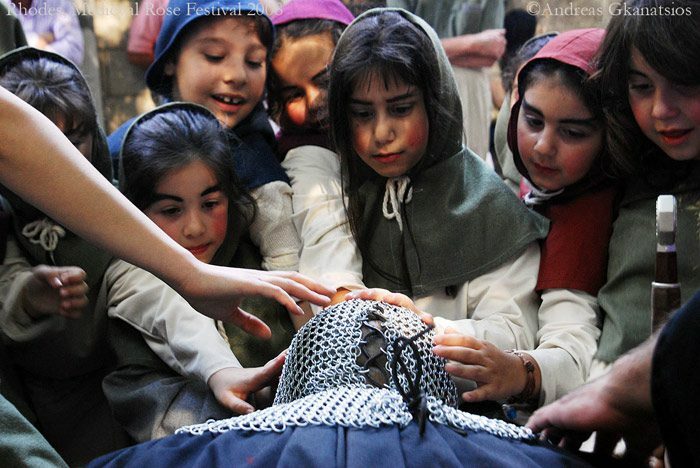 “Medieval Rose also organises educational tours in the Old Town and the Palace of the Knights, while every year it travels to different medieval festivals of Europe for the development of an intercultural dialogue. “Last year, Medieval Rose took part in the Fairy Tales Festival of Kea, organising a team game for the Search of the Dragon, beginning thus a new cooperation with another island of the Aegean,” Achiola said enthusiastically. Achiola sees a synergy between arts, heritage and folklife; as well as environmental concerns: “We became a member of the WWF Hellas and aim to develop cultural actions with focus on the environment. The Medieval Rose Festival’s next goal is to cooperate with other European Union members and Mediterranean countries in community cultural development programs- something which in the current global recession will do much towards building community well being and creating jobs in the cultural sector.